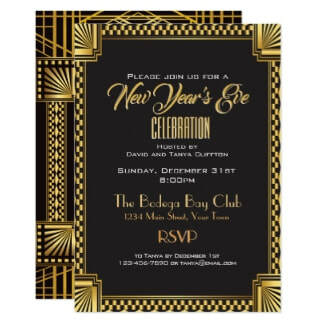 ​Think Art Deco, Downton Abbey, and the Great Gatsby and you'll realize that nineteen twenties glitz and glamour is the perfect theme for a chic modern day New Year's Eve party theme. Each of our spectacular designs is intended to awaken a sense of romantic style and elegance from days gone by. They're being brought to you by some of the artists who keep shop at Zazzle. 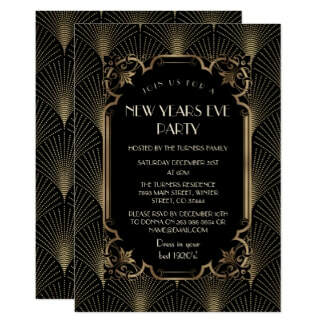 Browse through our hand selected favorite 1920's New Year's Eve party invitations to find the one that will define your special evening event. 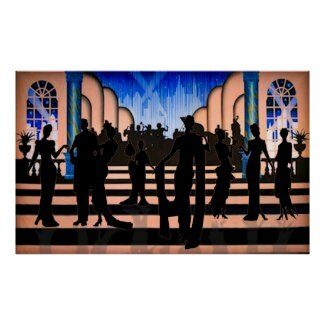 This page contains affiliate links which means if you make a purchase after clicking one, we might make a small royalty paid to us by Zazzle or Amazon. This costs you nothing extra and goes a long way towards helping us keep the lights on here at Retro.. Thank you for your support! Learn more HERE. Click to purchase this 1920's poster. Customize for size, shape and paper type. Personalize using an easy to follow template. 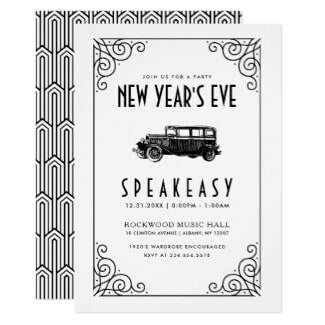 Minimal black and white art deco style New Year invite featuring a vintage car and beautiful scrolls. Black and gold invitation with a glamorous art deco style border inspired by the Great Gatsby. 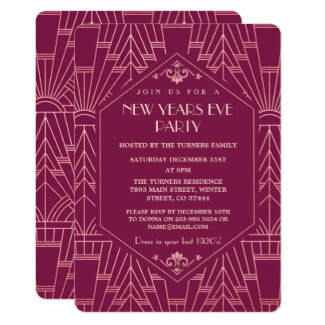 Beautiful dark pink faux Cooper Rose metallic style 1920's New Year's Eve Party invitations. 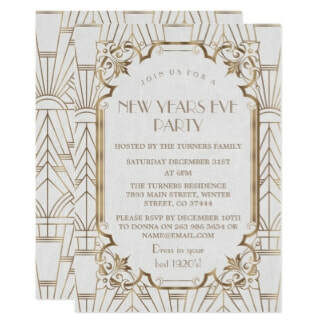 A gold and white 1920s style New Year's Eve invite that's bursting with art deco glamour and glitz! Stunning design features a black background with gold Gatsby style border and fonts. 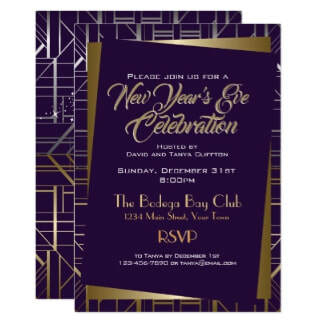 Off center but on-point, this chic NYE invite will be the talk of the town or at least the talk of your guests. 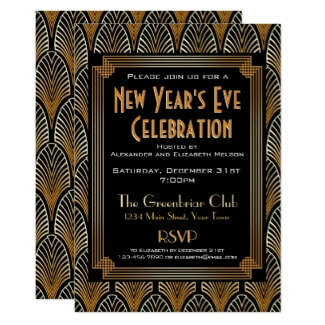 Elegant Roaring Twenties NYE invitation features a black and gold 1920's motif design. 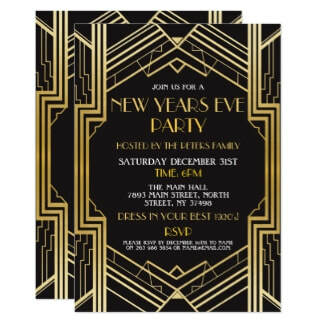 Gorgeous roaring twenties Gatsby style New Year's Eve invitations are white with gold accents and type. 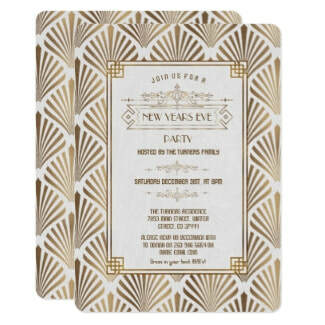 Pretty peacocks and golden swirls make these Great Gatsby invites pop with 1920's art deco flair. 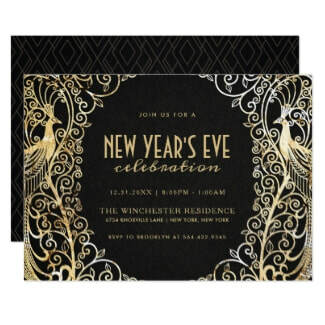 Glam New Year's Eve party invitations featuring a black with gold design you might find at Downton Abbey. 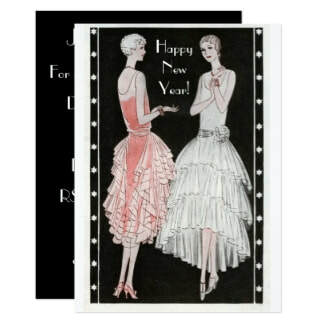 Two beautiful ladies adorned in Flapper attire are featured on these 1920 NYE party invites. 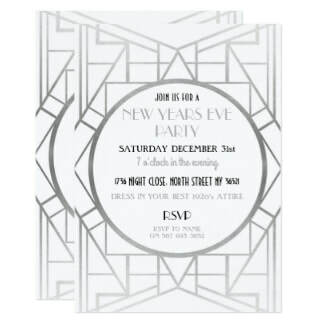 A simple line design on white that brings to mind the 20's Deco style for New Year's Eve.